In this workbook, the author builds upon testimonies intended to help the reader discover important insights about their experiences, the impact of these experiences, and how to use this information for personal growth. A practical approach is used that blends thought provoking questions and prompts to elicit reflective thought. 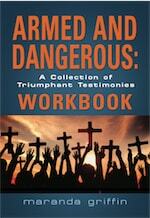 The Armed and Dangerous Workbook is a companion to the Armed and Dangerous book. In this workbook, the author builds upon a collection of testimonies that are intended to help the reader discover important insights about their own experiences, the impact of these experiences on their life, and how to use this information for personal growth and development. A practical approach is used that blends open-ended, thought provoking questions, and prompts to elicit reflective thought. The workbook is intended for multiple audiences to include individuals, small groups, as well as therapist working with clients and process groups. Each chapter contains an individual component as well as discussion that lends itself to groups and experiential activities. Eight women share their testimonies of overcoming life's storms. Maranda Griffin, PhD, LPC, is a woman of faith who attributes her tenacious spirit to the lived examples in her parents. She is a professor of Clinical Mental Health Counseling at Walden University. Formally trained in education and counseling, her desire is to see people fully maximize their potential. She has served in numerous federal, state, and community capacities. Maranda has facilitated workshops and trainings on numerous platforms and is published in counseling textbooks, publications, and personally. Most importantly, she is Eugene’s wife and Kenneth and London’s mother.